When one Scrooge of a rancher mistakes Santa Claus for a cattle thief and refuses to let him go free, Santa’s Christmas Eve ride is delayed. It’s up to this cowboy of a Kris Kringle to show his captor the spirit of the season and save Christmas once again. Joe Gribnau is a proud fifth generation Montanan and currently works as an elementary school teacher. 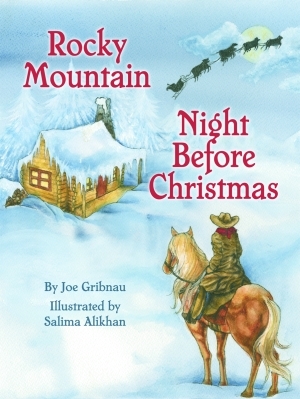 He received the inspiration for this book after asking his fifth grade class to write a new version of Night Before Christmas. Gribnau graduated from the University of Montana with a BA in elementary education and lives in Walla Walla, Washington, with his wife and two children. Salima Alikhan began writing and illustrating her own stories as a child, encouraged by the works of Hans Christian Anderson and the Brothers Grimm. A member of the Society of Children’s Book Writers and Illustrators, she has published an award-winning picture book and designed cover and interior illustrations for several magazines.